Operators are requiring faster field working speeds and larger implements and tractors because of a dramatic increase in farm size. The market is asking for and receiving tractors with more torque, more weight, and more horsepower. 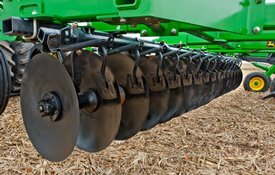 This increased draft requires more from the implement frame and hitch components. Frames and hitches have been redesigned with increases in frame tube thickness, additional diagonal bracing, and frame gussets for 600 engine horsepower requirements. As part of the redesign, implements include a beefy Category 5 implement hitch link, providing the necessary strength and dimensions to match a Category 5 tractor drawbar and associated load. The drawbar pin is increased from 51 mm (2 in.) with Category 4 to 70 mm (2.75 in.) with Category 5. 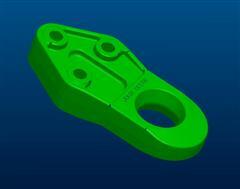 The hitch link thickness is increased from 47 mm (1.85 in.) with Category 4 to 58 mm (2.28 in.) with Category 5. The addition of this option will satisfy tractor Category 5 drawbar requirements. A single 152-mm x 254-mm (6-in. x 10-in.) 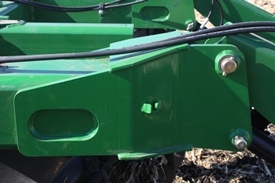 hitch tube enables tighter turns on the headlands without the inside tractor dual interfering with the hitch tube. 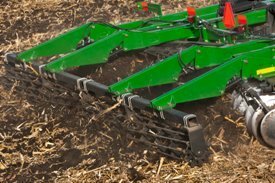 The industry-exclusive hydraulic rolling baskets found on the 2600 series disks and vertical tillage are also available on the 2720 Disk Ripper. The baskets come in a round-bar or knife-edge configuration. Round-bar – does a better job of busting clods and firming the ground. Slightly more prone to plugging over the knife edge because there are more bars. Works best in drier conditions. Knife edge – slices through clods. Works best in heavier, wet soils. Knife’s grab dirt and recycle more to size clods more effectively. Cleans out very well in the field. Down Pressure - a gauge on the front of the 2720 allows operators to set basket down pressure to ensure constant ground contact. Down pressure also allows for better sizing of slabs, clods, and rootballs and will leave a level soil profile. Float - the baskets can be put in the float position using the selective control valve (SCV) on the tractor. This allows the weight of the basket to roll over the ground. Raised - the baskets can be lifted off the ground when encountering a wet area of the field to help eliminate any chance of plugging. Down pressure should always be set using the gauge and operated from the cab. Baskets are attached to the frame by a welded gusset, not straps and bolts. This makes the basket attaching method much more reliable to withstand harsh-field conditions. NOTE: Rolling baskets are not available on the 7-standard narrow transport model. 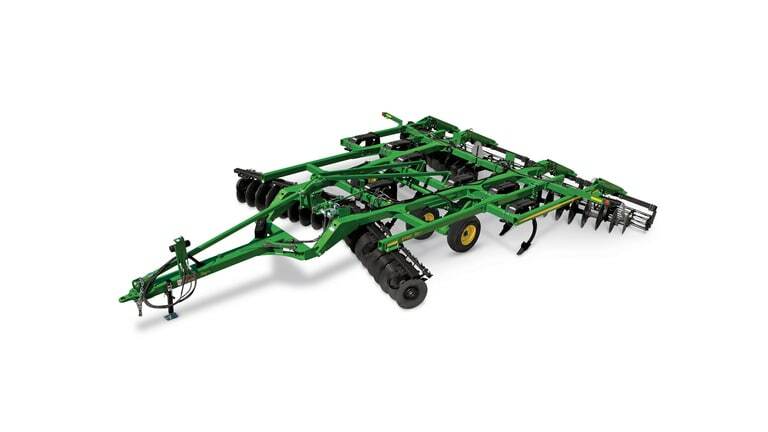 Contact a John Deere dealer for more information on Round-bar rolling baskets and Knife-edge rolling baskets. C-spring standards protect the gangs from obstacles. Sealed maintenance free bearings prevent foreign material from getting into the bearings, thus ensuring long life. The bearings come with a two-year warranty. The 2720 disk gang also features a floating scraper that is now mounted to the gang instead of to the gang tube. This allows the scraper to stay in constant contact with the blade when the gang side-loads in harsh conditions allowing for increased residue flowing capability. The 610-mm x 7-mm (24-in. x 0.256-in.) solid spherical low-concavity disk blades are spaced at 279 mm (11 in.) 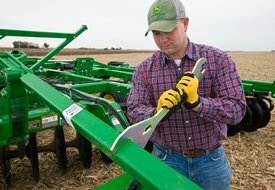 for sizing residue and to ensure residue flows well through spring tillage tools. The 660-mm x 7-mm (26-in. x 0.256-in.) solid spherical low-concavity disk blades are spaced at 279 mm (11 in.) 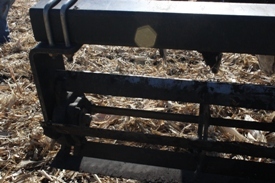 for sizing residue and to ensure residue flows well through spring tillage tools. NOTE: Pieces are not sized so small they deteriorate quickly, blow away easily, or are buried readily, and yet are small enough to flow through a field cultivator. TouchSet™ depth control for 7R (infinitely variable transmission only), 8R, and 9R Series Tractors is available as an attachment. Typical percentages of residue cover remaining from the 2720 Combination Ripper are listed in the table. These percentages do not take into account variables such as the conditions of the residue, speed, and soil type. NOTE: Percentages assume disk gangs are operating at 152 mm (6 in.) of depth. 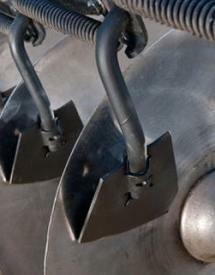 The 2720 offers increased weight per blade over the 512 to penetrate rock-hard soils and deliver up to 203.2 mm (8 in.) of blade working depth to bury residue. The chart below details the weight per blade of the 2720 with and without a basket versus the 512. 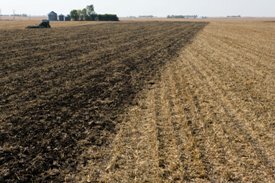 **Fragile residue includes crops: soybeans, edible beans, peas, wheat (less than 45 bu), sunflower, peanuts, and cotton. NOTE: The option code 6095 included in the base price of the ripper. Option 6095 is listed under the finishing components and is less round rolling basket. 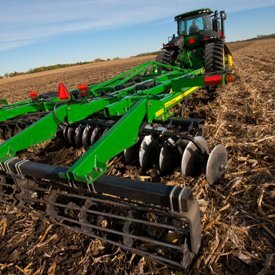 Walk-Over tandem wheels provide added support and stability for smoother operation in the field. 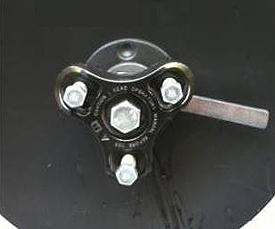 The wheels are located behind the front disk gangs and in front of the ripper shanks. 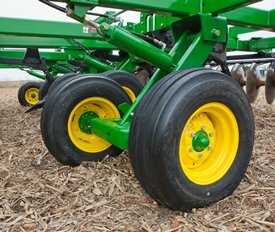 This allows the wheels to run on ground that has been leveled by the front disk gangs for more stable operation. Goodyear is a trademark of Goodyear Rubber and Tire Company. Michelin is a trademark of Michelin North America, Inc. The 2720 Combination Ripper uses the disk-shank-disk configuration (DSD). In the DSD configuration, the ripper standards are located between the disk gangs instead of behind them (or DDS) as some competitors use. With the shanks at the rear of the machine, the shanks can leave large ridges and valleys. 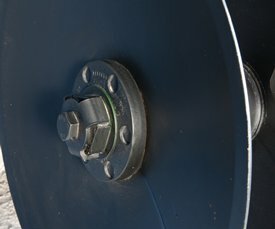 John Deere's 2600 Series Disks provide an innovative approach to tension disk gang bolts.